Legend Fitness 3170 Commercial Two-Tier Hex Dumbbell Rack - The 3170 by Legend Fitness is a dumbbell storage solution built tough to withstand the harshest weight room environments. Each rack is proudly Made In The USA from fully-welded, big 3 x 3 x 11 gauge steel. Dumbbell trays feature ¼ thick angle iron that are welded to each side of the frame making for a single, one-piece indestructible unit. Each tray is fully lined with an ABS plastic scuff guard to reduce powder coat wear and tear from re-racking dumbbells. The 3170 has an overall footprint of 24 x 46 with an actual dumbbell shelf width of 39.5 which comfortably holds six pairs of hex dumbbells of most any size. Want to customize your rack color to match existing equipment? No problem! 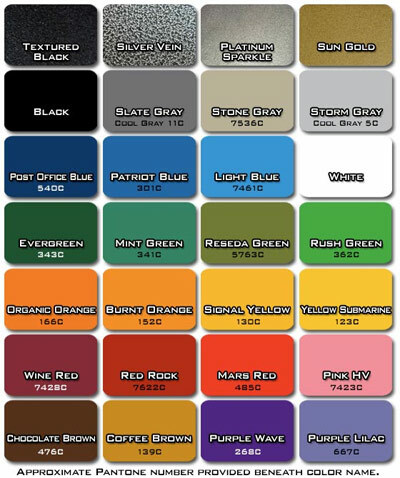 Legend Fitness offers many powder coat color options. Legend dumbbell racks are the ultimate in free weight storage solutions. Purchasing Legend Fitness Dumbbell Racks on GSA Contract - All Legend Dumbbell Racks can be purchased from Ironcompany on GSA Contract GS-07F-0104M and CMAS Contract 4-12-78-0066A.